Hand Pallet Truck or hand forklift usually operated manually especially in use in warehouse of Chemical Industry, Pharmacy, food storage, retail store etc. A Hand Pallet Truck or a regular forklift hand has 4 wheels, 2 forks and one steering unit. 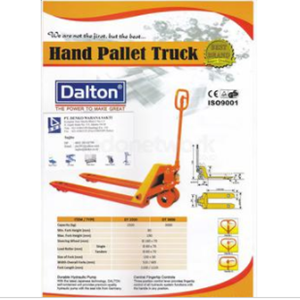 We sell Hand pallet truck or hand forklift with various brands and heavy load capability. OPK-OIC (a combination of products from malaysia and japan).